easy to come by but like cellulite but very difficult to get rid of. With advanced laser treatment, stretch marks can be dramatically improved. Their depth and color is reduced and the skin regains smoothness. The results are astonishing with 80% of the users reporting a significant reduction in stretch marks, including marks they have had for 20 years. 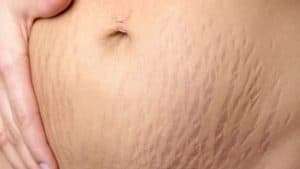 Stretch marks appear as parallel streaks of red or purple, thinned, glossy skin that over time may become depressed and scar like in texture and sometimes white in color. Stretch marks, or striate develop when the skin is excessively stretched during pregnancy, weight gain or growth spurts. Some medications, including hormones and steroids can also cause stretch marks. Stretch marks occur when rapidly expanding skin is stretched to its limit and tiny tears appear in the supporting layers of skin. Stretch marks occur in the dermis, the elastic middle layer of skin that allows it to retain its shape. However, when constantly stretched, the dermis can break down leaving behind marks. Dermal collagen is damaged and blood vessel dilation results in the formation of red or purple-colored stretch marks. Over time the redness may fade and the bands may become lighter in color than the surrounding skin. The bands may become depressed, shiny in appearance or develop an abnormal scar like texture. Men and women can get stretch marks on several areas of their bodies, including the abdominal area, thighs, hips, flank, breasts, upper arms or lower back. About 90% of pregnant women get stretch marks. Growth spurts and sudden or excessive weight gain cause stretch marks in young people. They affect 70% of adolescent females and about 40% of young males. Young women commonly get them on their breasts, thighs, hips, abdomen and buttocks. changes in the body associated with pregnancy. Stretch marks are one of the most well known and talked about skin changes that can occur during pregnancy. They are thought to be secondary to thinning of the skin during this time period from female hormones which disrupt the protein balance in the skin. Almost 90% of pregnant women will experience stretch marks, usually developing during the third trimester. There is a genetic predisposition to developing stretch marks during pregnancy. Many women find the appearance of stretch marks to be distressing. There are plenty over-the-counter treatments for stretch marks, such as Strivectin. Unfortunately, no topical remedies have been medically proven to improve the appearance of stretch marks. RetinA, glycolic acid, alphahydroxy acids have been prescribed with very little success. Dermabrasion or chemical peels have also been used. The results of these treatments range from fair to minimal. Surgical options involve removing areas of stretched skin. In a tummy tuck procedure, for instance, skin below the belly button is removed. This is often an area in which stretch marks are prominent. It also works by tightening the skin in nearby regions. These surgical techniques are effective, but are more invasive than other options and thus involve longer recovery time. New advances in lasers have shown improvement in stretch marks. The degree of success with laser treatment will be impacted by your age, your skin tone and the age of the stretch marks. The science of using lasers to remove stretch marks is that it stimulates the skin’s natural synthesis of collagen. Collagen is a protein rich compound occurring in the body that repairs and rejuvenates skin tissue. Cosmetic laser treatment for stretch marks works to stimulate renewed growth of depleted collagen. It removes damaged skin tissue, seals broken blood vessels and repairs the fibers of the middle skin. This helps to “fill in” the stretch marks. Anti-stretch mark creams also follow the same line of treatment but are not very effective. This is because creams do not penetrate beyond the top layer of the skin. Thus, they do not reach the layer where the skin produces collagen. However, lasers reaches the underlying levels of the skin and effectively repairs the damage. What are the different kind of lasers used for stretch marks?